Thank you so much for shopping with Emily‘s House London. 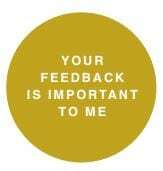 I would love it if you could help me and other customers by reviewing product(s) that you recently purchased. It only takes a minute and your feedback would really help. Click the button below and leave your review!